Snapchat Disappearing Person Alerts are a disappearing message to help find disappearing persons. The alerts are a new tool to assist police in missing person investigations. 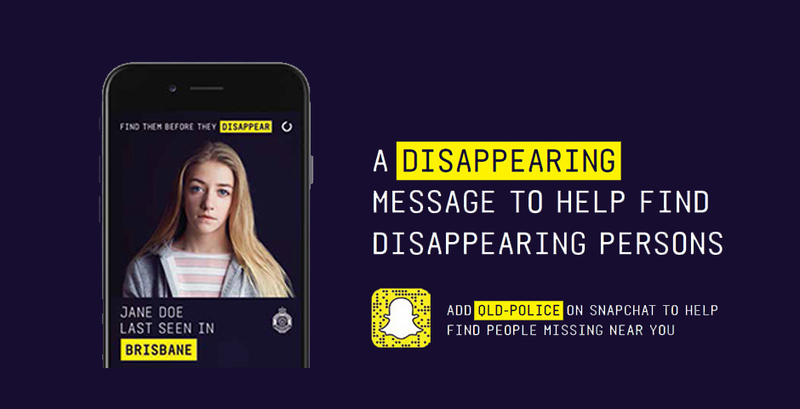 Sent through Snapchat, Disappearing Person Alerts are real-time, geo-targeted messages that help find missing teenagers. Using the native functionality of Snapchat, the alert (disappearing after 10 seconds) communicates a highly emotive message, "Help find John Citizen before he disappears." In Australia, one person is reported missing every 15 minutes and the group most at risk of disappearing are teenagers. In the search for these missing persons, police can only do so much—they heavily rely on information from the general public. The more people who know of a person's disappearance, the greater the chance of them being found. But traditional alerts were failing to reach the public within the all-important first 24 hours, and specifically failing to reach teenagers. For such a prevalent problem, in a country as big as Australia, there had to be a smarter, faster, and more targeted way to alert the public and assist police. Australian police forces are typically very conservative. Dealing with a range of serious issues with critical consequences, every policy they adopt or new communication they embrace needs to be thought through. As such, initial concerns were around the use of Snapchat—a medium widely associated with sharing the sort of content you want to disappear forever. With no precedent, Queensland police were initially reluctant but could see the power of a disappearing medium to convey the severity of a disappearing person case. Our idea challenged the trivial perception of Snapchat, proving that this medium could be used for good, activating teens and helping to create positive change. We've been fortunate enough to experience a number of rewarding moments along the journey, the first being the launch of the campaign during National Missing Persons Week, where the initiative was endorsed by the Queensland Police Assistant Commissioner, but more importantly had the overwhelming support from the families of people still missing. But our proudest moment to date was seeing Disappearing Person Alerts immediately being used as an effective police tool. The first alert was sent the day the campaign went live—the missing teenage girl was found within 24-hours. Our intended real-world impact was to find a way to notify more young Australians of people that have gone missing. The more people who know of a person's disappearance, the more people that can act as the eyes and ears in assisting the police. This was an exploratory project—the police had no expectations, but hoped by adopting new technology, with a powerful message, that positive change would result. The immediate and ongoing real-world results, impacting young Australian lives, continues to surpass our expectations. Disappearing Person Alerts continue to be used today, bringing positive change throughout communities in Queensland, with discussions to expand interstate and overseas. The breakthrough moment was realizing the strategic and emotional potential of Snapchat - not only is it the fastest growing social media platform amongst young Australians, its inherent functionality (each message disappearing) highlights the severity of the situation facing someone in their area. As mentioned, Snapchat as a medium, its technology and native functionality, is at the very core of what makes Disappearing Person Alerts so powerful.